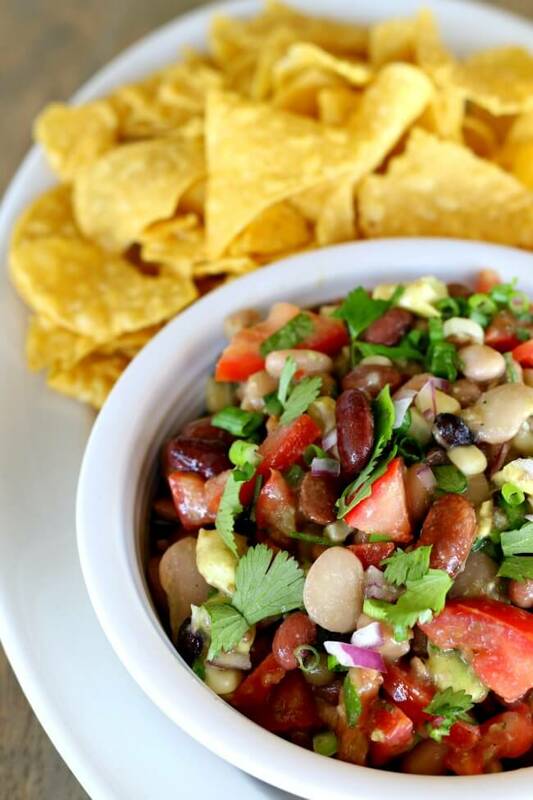 This recipe is made possible by Hurst’s Beans. Thanks so much for supporting my blog and its sponsors. We have something that we make called Texas Caviar. 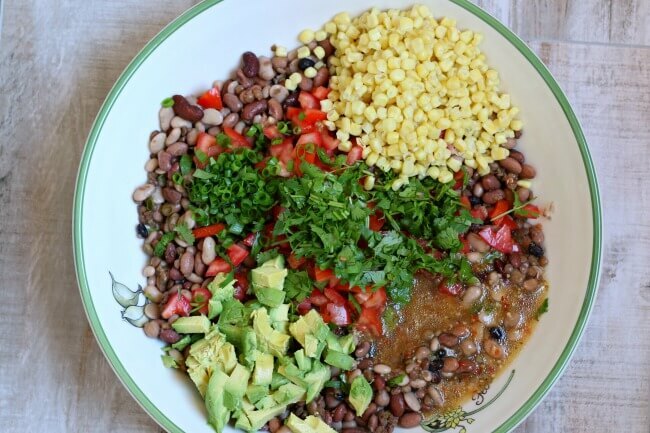 It’s basically a salsa with beans, corn and a bunch of other ingredients…and it’s delicious. If you’ve had it, you know what I’m talking about. 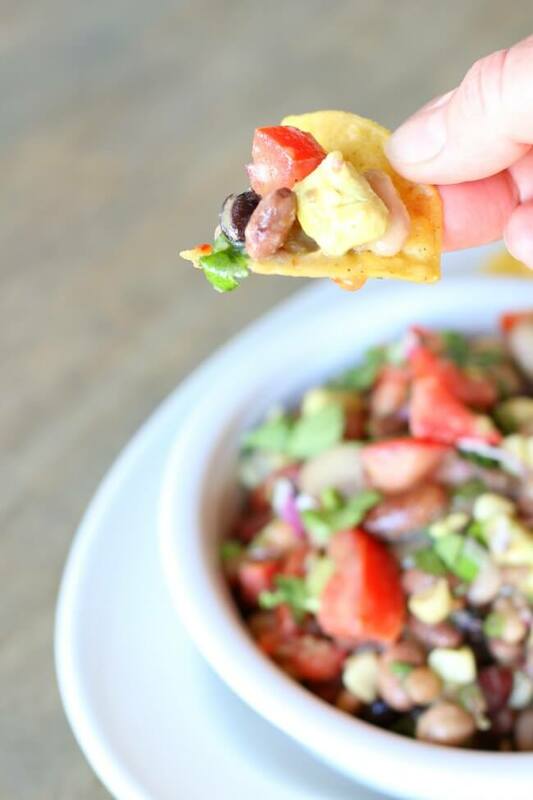 I used that Texas caviar recipe as inspiration for this salsa. Instead of just tossing in a few cans of beans, I cooked dried beans from scratch in my slow cooker. I used a package of Hurst’s 15 Bean Soup. 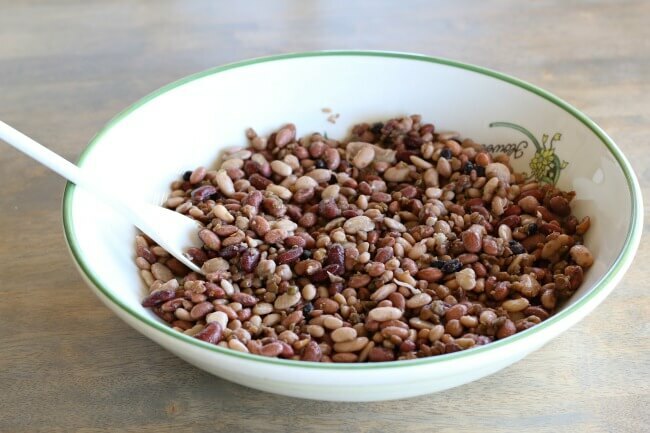 As you know, I love Hurst’s products and making their dried beans in the slow cooker is super easy and the best way that I know how to make beans. I love making dried beans in my slow cooker because it’s one of those things where you put them in and forget them for hours and hours and. I don’t have a pressure cooker but I bet making dried beans in the pressure cooker would work really well too (in that case you would NOT leave them in for hours and hours :). I start out by soaking my beans overnight in water and a bit of salt. Then I drain and rinse them and stick them in the slow cooker with more water and more salt. I literally leave them in the slow cooker on low for 10 hours (your slow cooker may be faster or slower) and then drain the beans and let them cool a bit. While they are cooling down, I chopped up roma tomatoes, green onions, cilantro, red onions and avocado. Make sure to visit Hurst’s Beans website for lots of great recipe ideas using their dried beans. If you prefer to get your recipes from Facebook you can go here. You’ll definitely need a recipe for all the leftover ham that you’ll have from Easter! You’ll combine everything together in a big bowl and then add in some Italian salad dressing, corn, garlic and salt and pepper. 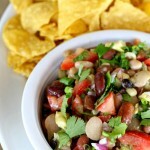 We like to make this recipe for potlucks and picnics and serve the salsa with tortilla chips. It’s one of those things that is very addicting and people will keep coming back for more! Luckily, this recipe makes a lot. 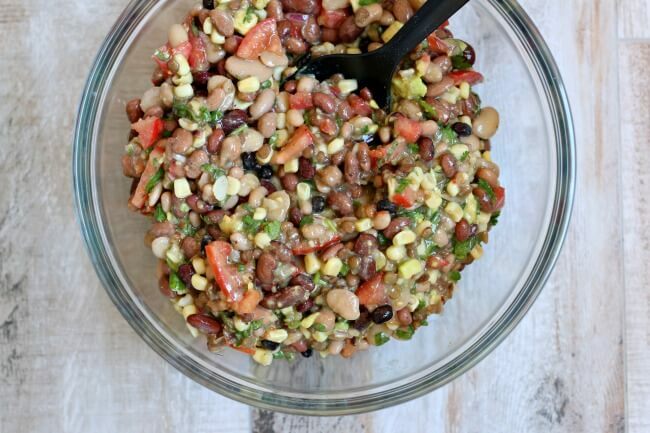 This recipe is sometimes referred to as “Texas Caviar.” It’s a corn and bean salsa with fresh tomatoes and avocados and a zesty Italian dressing. Easy to make and totally addicting! Add package of beans to large bowl and fill with lots of water, enough to cover the beans by 2 inches. Add in 1 Tbsp of salt. Let the beans soak for at least 8 hours. Drain the beans and rinse off in a colander. You can save the seasoning packet for another recipe. It has good flavoring for soups! Add the beans into the slow cooker. Add in 2 tsp salt. Fill the slow cooker with enough water to cover the beans by 2 inches. Cover and let cook on low for about 8-10 hours, or until beans are tender. Drain the water off of the beans and add the beans to a large serving bowl. Let them cool. Prepare the other ingredients while beans are cooling. Add all the other ingredients (besides salt and pepper) into the serving bowl and fold everything in gently (so you don’t mash the beans and avocados). Salt and pepper and garlic powder to taste and then serve salsa with tortilla chips. camping trip (over 70 people last year!) and I think I might take this! Avocados turn brown but not super quickly. Probably 5-6 hours. Holy YUM! I’d eat that salsa straight up with a spoon and call it lunch! What a great and simple salsa. Love the names too, Texas caviar and 15-bean salsa.